Cleardocs Pro is a system that puts the Cleardocs question interface into your website. To your clients, it looks like your site or intranet — with your corporate colours and contact details (and no Cleardocs branding). This means you can direct your clients to your website to start an order for a Cleardocs document package. Your clients complete the base information which you then review and approve. There are no costs to have this set up and no uplift on Cleardocs document fees. With some basic web page adjustments, Cleardocs Pro can be set up on either your intranet site for your staff to use OR on your public facing website for staff/clients to use. Below is a sample of how Cleardocs Pro could look on your website with your firm name appearing where "Numbers & Numbers" is. 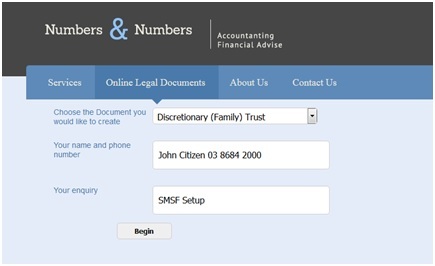 Can my clients complete their personal details in the question interface themselves? Yes. Your clients complete the interface questions with their personal and other details for the document package that they have selected. the tailored legally compliant document will be emailed directly to you. There are no hidden costs. Cleardocs Pro is charged at your standard Cleardocs rates. Your clients will not see any invoices or the cost of the document. If you would like to go ahead with Cleardocs Pro, you can easily set this up on your website or intranet by following these steps.